TORA BORA, AFGHANISTAN — An emaciated and heavily bandaged Osama bin Laden offered the U.S. a final chance to surrender Monday. Speaking via satellite, bin Laden issues a final warning to the U.S.
"Enemies of Allah, this is your last chance to leave Afghanistan alive," said a battered, soot-covered bin Laden in a videotaped statement broadcast on the Al Jazeera satellite network. "I mean it." 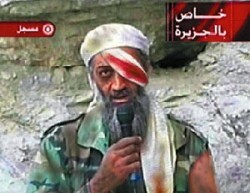 Staring directly into the camera with his good eye, bin Laden reiterated his vow to drive the U.S. from the country. "You may have dozens of bases in Afghanistan. You may have thousands of bombs," bin Laden said. "But know this: We still have three or four guns and a full crate of bullets. And some knives, I think. You cannot hope to prevail."